WASHINGTON — The Japanese government, working with private ventures, announced plans March 20 to establish a nearly billion-dollar fund to support the development of space startups in the country. 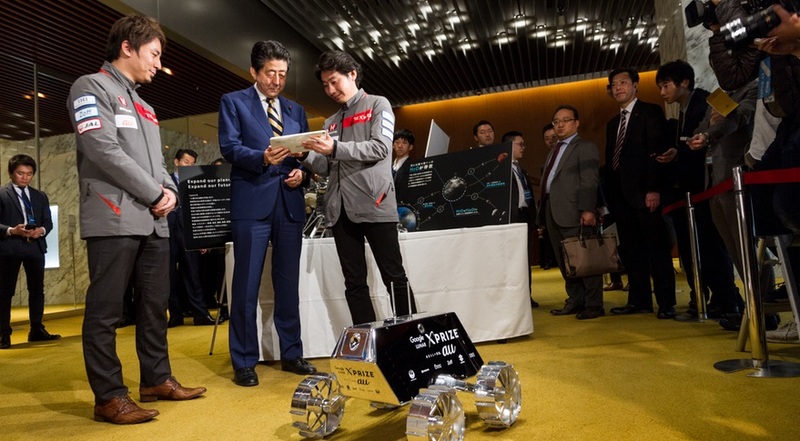 Prime Minister Shinzō Abe announced the new initiative, whose cornerstone is a pool of 100 billion yen ($940 million) of venture capital to be offered over five years to companies in the space sector in the country. That funding will be provided by the Development Bank of Japan, Industrial Innovation Organization, and other organizations, although the announcement didn’t state how much funding would come from each organization. Another element of the “support package” for space venture development is a program that matches investors, including individual investors and companies, with startup companies. Government documents listed 46 members of this “S-Matching” program, ranging from satellite operator Sky Perfect JSAT to Japan Airlines Corporation and Nikon. Japan has lagged behind the United States and Europe in the development and funding of space startups. A few companies have found success, including ispace, which raised more than $90 million in December to fund development of lunar lander spacecraft. Astroscale, a Singapore-based orbital debris removal company with offices in Japan, raised $25 million last year. The support package announced by the Japanese government is not limited to funding. It also includes projects to find talent for space startups and technical cooperation between companies and the Japanese space agency JAXA. Another aspect of the initiative includes the potential to change Japanese law to support companies in the satellite servicing and space resources industries. That could be patterned on laws passed in the United States and Luxembourg to give companies rights to resources extracted from the moon or asteroids. “I’m very pleased Japan will join the U.S. and Luxembourg in leading the discussion among the international community to establish clear rules for private companies wishing to utilize resources on the moon,” said Kyle Acierno, managing director of ispace Europe, the European office of ispace based in Luxembourg, in a statement. Acierno is also the chair of the technical panel of The Hague Space Resources Governance Working Group, an organization seeking to develop an international framework on space resource activities. His company, he noted, is the only Japanese company involved so far with the effort.